Unusual Leaper goblet - 4⅜" (111 mm) high. Eric Leaper was born 1921 and played the violin in church as a child in Tottenham, London. He attended Hornsea School of Art for just one year before he was called up to serve his country in the Second World War. On leaving the army he returned to the place that had been kept open for him at Hornsea, but it was a life class and Eric had developed a desire to become a potter while in the army. He was advised to apply to join the pottery course at the Central School of Art, and remembers that at his interview Dora Billington asked him why he wanted to do a pottery course. She was amazed when he told her he wanted to earn a living as a potter -- all previous applicants had wanted it just for an extra qualification. He attended a release course while working as a sign writer, and learnt to throw pots. On completing the course he married and moved to Herston near Swanage, Dorset to set up his own pottery. There was no guaranteed income from the pottery, so he continued working as a sign writer while his wife taught at a local school. The cottage they moved into had no running water and no drainage. The 8 foot by 4 foot kiln was controlled by a switch borrowed from a disused cooker. Firings took place at night when electricity was cheaper, and one morning Eric and his wife both left for work and forgot to switch off the kiln. When they returned in the evening the kiln and its contents were ruined. Pieces of pottery had dropped into the elements leaving them unusable. Fortunately their neighbour was an electrical engineer and helped Eric calculate lengths and wind new coils for the kiln. He gained valuable experience at Swanage, although the pottery was not successful. "The reason," Eric explains, "is because I was making lousy pots!" He moved to Newlyn, South Cornwall in 1954, where he started the pottery known as Leaper, Newlyn. In Newlyn Eric Leaper was as well known by the potters and fishermen for throwing parties as for throwing pots. Leaper, Newlyn lasted until 1980, and it was during this time that developed and produced the multi-coloured 'splash' designs for which he is most famous. 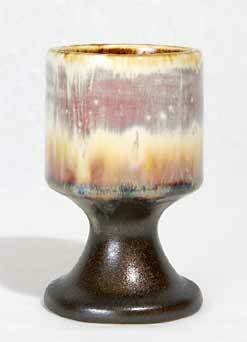 Many of the glazes contained dangerous chemicals, and it was from these that some of the richest colours were obtained. After the closure of Leaper, Newlyn the family moved to Brane, a very small village near Sennen and quite close to Land's End. Here they produced the brown-bodied pieces with the red-orange blobby glaze. Vessels, plant pots and various animals and birds were made, all with this distictive appearance. When the children had married and left home Eric moved to a small cottage in St Just, Cornwall, and it was here that he died in March 2002. His son, Simon Leaper, is a talented potter. Leaper, Newlyn, set up in 1954, was the first of the four Newlyn potteries that experienced tremendous success in the 1960s. Eric Leaper's imaginative use of colour and good eye for design combined with some good contacts for retailing and exporting his goods ensured the success of Leaper, Newlyn. At their peak they were using four kilns and had a workforce of six. Leaper designs stand the test of time and like Poole pottery of the 1960s and 1970s can be appreciated not just as retro but as good designs. The pottery closed in 1980.